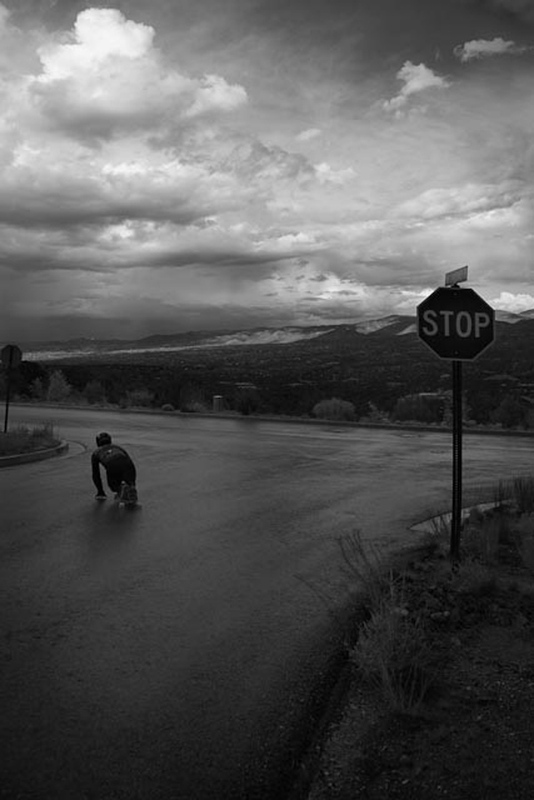 Phil Ginn carving off some speed somewhere in the heart of New Mexico. Photo: Joel Lipovetsky. New Mexico is at the south end of the Rocky Mountain range. Geologically, everything here was brought about by volcanic activity. (You can see something like 60 plus extinct volcanoes from the foothills of Albuquerque.) Due to the fact that everything is made from hard granite, nothing erodes—and this means steep, unbanked roads. We get somewhere around 8 inches of average rainfall in Albuquerque annually and somewhere near 350 days of sunshine! Translation: year-round shredding. Dave Price loops across a tunnel of one of Albuquerque’s favorite ditches. Photo: Joel Lipovetsky. Here’s a couple of facts about New Mexico you should know: It’s not “New” and it ain’t “Mexico”. 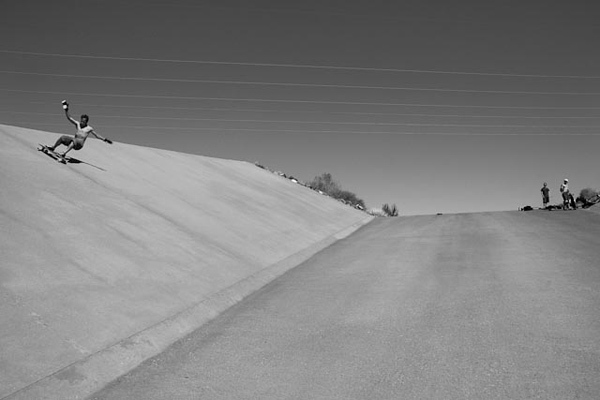 We do however have a grip of wicked-good skating, and I can say from experience, New Mexico is an awesome place to shred—an endless paradise of ditches as well as ripping roads. 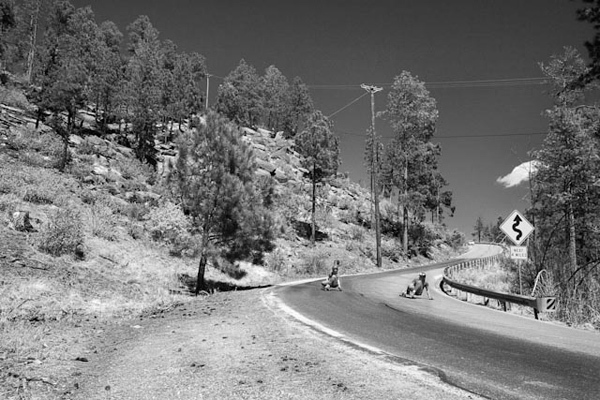 David Price, David Angelus, Ben Dubreuil, and Phil Ginn descend a winding road somewhere near Dixon, N.M. Photo: Joel Lipovetsky. I started riding as a commuter back in September 2006, and that Christmas my friend Ben got his first pair of Gravity Slide Gloves—the ninja-turtle jobs. We rode every day and my mind was blown with all the possibilities. I personally became obsessed with Indian School Ditch and my friends and I soon met other dudes from high school who also wanted to go fast. It was on! Colorado speed-king, Kyle Wester, hits a corner on the old Santa Fe Outlaw race course. Photo: Joel Lipovetsky. There was no supporting scene that we knew of at the time, so we just did our own thing. Regardless, we were fired-up on trying to see how fast down the ditches we could go (45mph+ with a tailwind). Sadly thought, being that we were an isolated pod of riders, a couple of the original crew moved-on, and boards got shelved for other interests. But I was committed. I began convincing people to drive me an hour north to Santa Fe so I could continue riding down hills. I met Dave Price of Timeship Racing there and he asked some important questions: How fast have you gone? How fast have you stopped? Where’s your fullface? Thank goodness for Joe, Dave, and the TSR crew. They are fundamental to New Mexican shredders. Moving back in time to 2009: Timeship is now having public events. Three buddies and myself drive up to Santa Fe, ready to try this “outlaw racing” thing. There are maybe 12, maybe 13 local riders, including 4 or so more who drive in from Colorado. We meet a couple OG New Mexico skate-bosses: Will Brunson and James West. 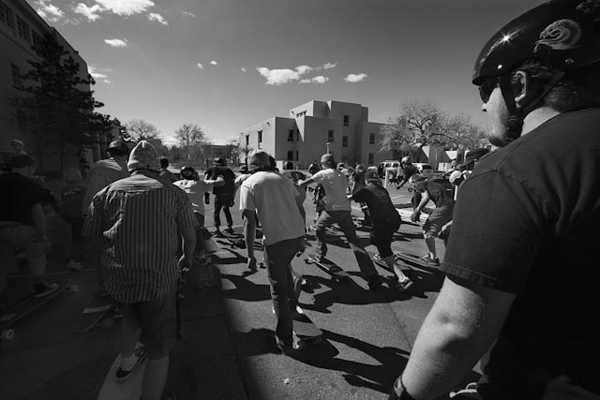 The start of the quasi- annual Campus Push Race at UNM, held by David Angelus. Photo: Joel Lipovetsky. Fast forward to 2010: Now we’re hosting our own races in Albuquerque. We have a regular crew of about twelve, fourteen regular racers. Our scene is starting to grow. We’re seeing kids on campus skating every which way—riding everything from Landyachtz to Longboard Larry. Timeshippers, William Brunson and Dave Price, check out some New Mexican canyon runs. Photo: Joel Lipovetsky. Present day, 2012: We just had a race with sixteen racers in open divisions, eight in the grom division, including one female. This might seem small compared to other places, but the scene is definitely growing. You have to consider the size/population ratio of New Mexico. We are the fifth largest state, but only 36th in population. When we have a race now, riders drive in from Santa Fe & Socorro, Gallup & the Taos area, Farmington & Aztec, and even some driving four hours from down south, in Las Cruces, Silver City, or Alamagordo—all of these skaters coming to share the Stoke Action. 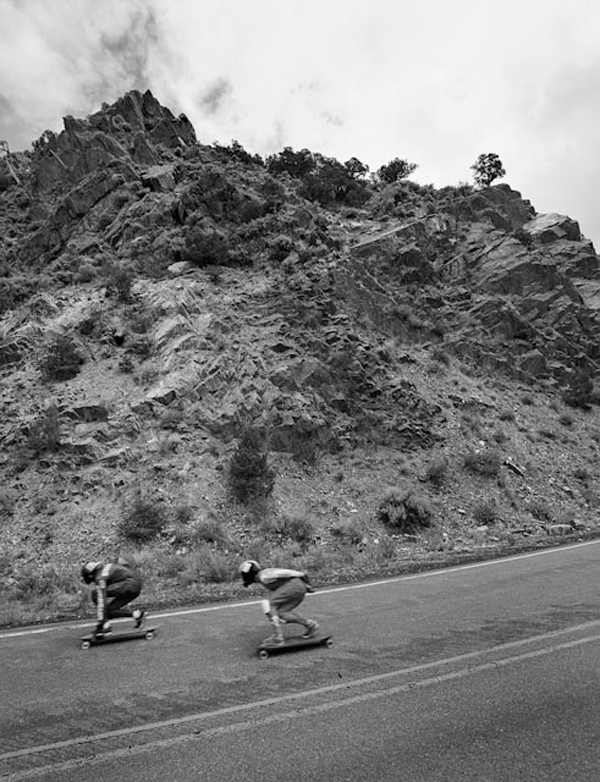 Price and Brunson shredding in Los Alamos, N.M. Photo: Joel Lipovetsky. We also have a growing online community now as well: the Duke City Bombers. Check us out on f-book. These days you can always find a session on the local runs—most of the best running east to west—from the foothills to the river. David Angelus throwing a heelside slasher—Bear style. Photo: Joel Lipovetsky. Timeship Racing is killing it in Santa Fe, supporting the local scene all over NM. The shops we have in Albuquerque are Skate City (which is the oldest skate shop in the SW, since ’76) and 4D’s Board Shop (a recent addition to the community, but one that’s been very involved in our emerging scene). Our crew is now having monthly events with support from these local shops as well as larger companies. Chris Cade & Phil Ginn riding close in the final heat of a recent NM outlaw race. Photo: Joel Lipovetsky. Pretty much everywhere I’ve skated in New Mexico has some kind of terrain for some kind of skateboard. North and West New Mexico have runs with several miles of 55mph riding speeds. Central New Mexico has Albuquerque, the Sandia mountain range, and some world-renowned ditches. South New Mexico remains pretty much unexplored by our crew, but this summer we’re organizing a exploratory shuttle around the South end of the state. Our eyes are on a run coming off both sides of the Continental Divide! Santa Fe Local, Ryan Ricker, tucks an Indian School run. Photo: Joel Lipovetsky. We might be one of the smallest scenes in the Rockies, but the scene is growing everyday. We’re working hard, sending out the fliers, skating, talking to the homies on campus, skating, spreading the stoke, and skating some more! The truth be told, we live in a skateboard wonderland where we ride year-round. New Mexico has the terrain, and the riders to shred it. There are more and more skaters in New Mexico traveling further and further to events and this year is no exception. We’ve got grom squads and other tribes/clubs popping up all of the time. New Mexico has an awesome, diverse, and growing community— hit us up sometime. We look forward to shredding with you real soon. Chris Cade is a shredder hailing from Albuquerque, NM and he rides for Big Myth Skateboards, Logic’s Kung Fu Griptape, and the Duke City Bombers.